Ron was my driver yesterday for yard sales and treasure hunts. It had been a pretty good day in my estimation since I bought a split oak hand made basket at the Humane Society thrift store for 75 cents. We found books and drafting tools at the Lutheran church’s sale but the treasure for me is shown in the picture. As we were on our way home I saw a last sale sign and asked him to stop. OMG. There was a stack of 13 boxes of Huepoint tubes of threads. 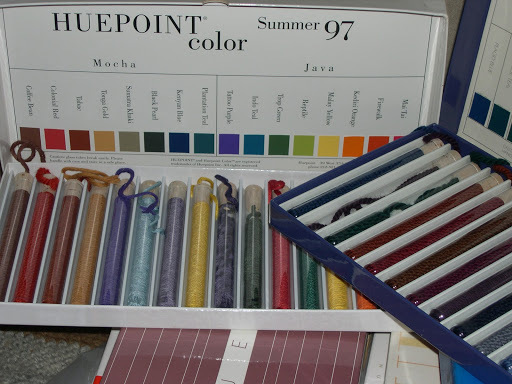 Each box is a season color forecast from the Huepoint service. They are used by retailers and manufacturers in the clothing and home decoration industries. A few of the boxes I bought have cotton fabric squares in them, too. Most of these glass tubes contain cotton ropes that can be seperated into heavy threads for embroidery stitches but some of them are the yarn samples that can be used for felting or whatnot. I already own 3 boxes of these and have parcelled them out very sparingly when working on a project. I feel terribly rich to now be the proud owner of a total of 16 boxes. Projects are swirling in my head! Sometime down the road I may wind the threads onto cards so I have the empty glass tubes. They have a cork stopper with a hole in the top. I’m thinking that they would make perfect bead holders that I could just shake out a few beads at a time. Sometimes it’s difficult for me to get ahold of beads if my hands are acting up like they are today. So, it’s time to rest and enjoy the Saturday morning fabric art shows on PBS.